However I need my chocolate to be part of something bigger. It can be the star of the show. Definitely. I prefer it’s sweetness be offset with the tartness of fruit. Strawberries. Raspberries. Pineapple. It’s texture elevated with the addition of nuts, coconut, honeycomb, popcorn. I’ve come to believe my chocolate preferences are an extension of my personality. The part of me that gets bored quickly. The part that says too much of anything (even if it’s good), can become dull and monotonous. My husband and daughter do not share my opinion. To be honest they passionately disagree with me. So for them, this dessert was perfect. I on the other hand struggled. I followed Dorie’s recipe and then promptly threw it out. I did not like it! Actually none of us did. I turned to my collection of cookbooks and searched the internet to see what I was doing wrong and how I could improve the flavour. I noticed a few of the recipes had butter added to the melting chocolate and cream mixed into the final product. I ended up following Dorie’s recipe and then adding the extra’s from Donna Hay’s recipe I found here. My hybrid mousse was much nicer. And the raspberries took the taste to another level. I’m looking forward to reading what the rest of the French Fridays with Dorie group thought of this one! Tags: chocolate, cooking, dessert, food, french fridays with dorie, mousse, recipes | Permalink. I know it’s blasphemy, but chocolate doesn’t thrill me like some other things do. I am also a fan of mix-ins & texture so I think I’m more on your team than your husband & daughter’s. 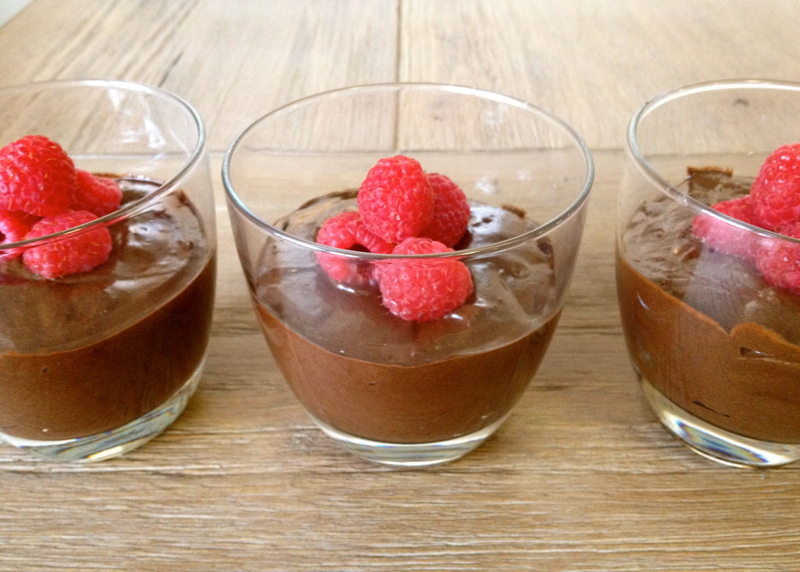 Your mousse looks beautiful with the raspberry garnish – I kinda failed in the garnishing department. I agree with you about chocolate being better combined with something which contrasts with it. And I too get bored easily. hmmmm, I feel a survey coming on! and i agree adding fruit and nuts really makes chocolate sing! I put raspberries and shredded mint for my white chocolate mousse and it was super delicious! 🙂 Although for the rest of them, just the chocolate was enough for us, but toasted nuts and the like wouldn’t have been terrible! Interesting. I haven’t tried Dorie’s recipe yet (running way behind this week) but I am curious to see how it comes out. I already have a favorite mousse recipe which comes from my Williams Sonoma collection and it is just perfect. I think it also has cream folded in. So we’ll have to see how Dorie’s compares. 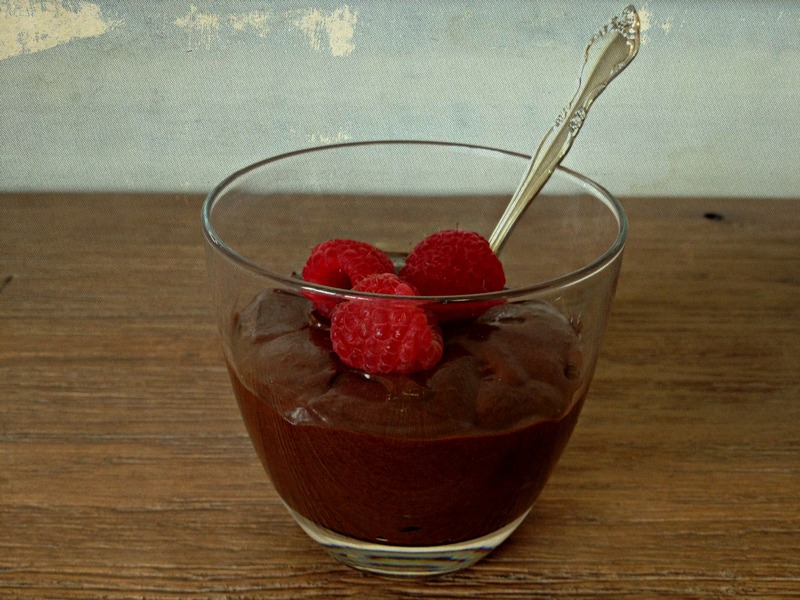 Sanya, your Mousse au Chocolat looks wonderful, I love the dark chocolaty color and the wonderful raspberries on top! I actually also happen to enjoy a little bit of fruit or nuts with my chocolate treats. Your mousse looks fantastic! I like the idea of additions. Mine wasn’t too fabulous, though my guests enjoyed it. Hope your weekend is lovely! I like your raspberries. Definitely gave a great pop of color! Looks like it turned out great in the end! I usually make mousse with whipped cream but I thought this was good. Sorry your first batch didn’t work out. I love the raspberry garnish on your final success. I’m so glad you were able to tweak this to your liking…I think that’s perfectly fine for us seasoned Doristas 🙂 I love mine with berries, too. Interesting, Dorie’s recipe was by far the easiest I have tried (compared to both Pépin and Julia Child) and I liked it the most. What went wrong? What was wrong with your first mousse. Was it too bitter? Your second try looks delicious and, obviously, it was. If you read the other Posts, this mousse produced mixed comments. Because of my mixing up the recipes, I am not making this until tomorrow so I am a bit curious to see how it turns out. Oh, I don’t especially love chocolate so my neighbors have all volunteered to be taste testers. Go figure. It was bitter, but my problem was the chocolate kept freezing up on me as soon as I added the egg yolks. It turned into thick unmanageable mud! Sometimes you just need to make a few tweaks. I’m so glad you found a version that you really enjoyed. It looks beautiful with the raspberries.